Presume the Death of a Relationship before it happens. Objective Collapse is just a quantum theorist’s means of clinging to the belief that romance is still attainable in Western culture. Classical novelists and observational psychologists alike have spent the last twenty-four hundred years obsessed with this most elusive of human experiences. Tellingly, in all that time neither field has had much that is novel to say on the topic. Still, we continue to buy their lies with pieces of the very souls we are trying to save. Lies perpetrated by those who tell us that there are only eleven basic human emotions and their counterparts, twenty-two words with which we encompass the entirety of anthropological history. Contrast this with the forty-eight emotions classified by the Human-Machine Interaction Network on Emotion and it becomes clear that, like the rest of existence, love obeys the natural language of the universe. So, embark on a superposition encompassing the three possibilities extant in our calculations. The former two determinants, polarized by the belief of 73% of Americans, exist only to describe, relatively, the third. In order to force a resolution (wave function collapse) of this physical system which will satisfy either eigenstate, it is essential to first observe the Rational State Apparatus that is always functioning at a conscious and subconscious level. Solitary, approachable, but skittish twenty-seven year old seeking tattooed, stable male. Plus if he makes me laugh, prefer local, sorry but only white guys because i am only attractive to them. HIV Positive. Over 50. Looking for partner of similar lifestyle. No drama, crazy ex’s, tats, tobacco use, prison record, young children, or really excessive anything…. Nothing ventured, nothing gained. Thirty-five year old male looking for a nice female with own residence who would like a long-term relationship. Race, Age, Looks not important! Recently laid off with no prospects. I’m nice, white, fit, no kids! Dudes of the Bay: My ladies and I will be out in the Lower Haight this weekend and I am looking to stack the chips for my two best friends to meet some guys actually worth talking to. Speak English and have a job. Email me if you are interested, with a pic, and I will give you details. Disabled bisexual male looking for help decorating. If you’ve ever marveled at the difficulty present in trying to find a romantic partner that lasts, you must admit the odds are fairly daunting. It isn’t any wonder that more than three fourths of single Americans have experimented with online dating. Simply answer a few hundred questions about your sexual habits and whether or not you like cats, and the return key will instantly provide a list of “matches.” You can even respond positively to questions like “Would you ever eat something out of the trash?” or “In a certain light, wouldn’t nuclear war be exciting?” and still be someone’s 96% match. Of course, matchmaking profiteers are not the only ones who opine that the difficulties in finding “true love” can be surmounted. The website http://www.lessthanone.com/ is another great example. Their premise is that, given a population of 800,000 and a 95% attrition rate of those who can be considered “available”, there is half a person out there who’s soul is calling to yours. If these factors are the only paradigm from which a relationship can be viewed, encountering that perfect someone should be a task that grows exponentially easier as population and ease of communication increase. After all, Schrödinger need only have opened the box to receive his answer. 1 is the impossibility of a perfect match. 2 is the deficit with which we’re realistically willing to settle. 3 is the understood plausibility of relational termination at some point, be it a week after meeting someone or fifty years into the marriage. 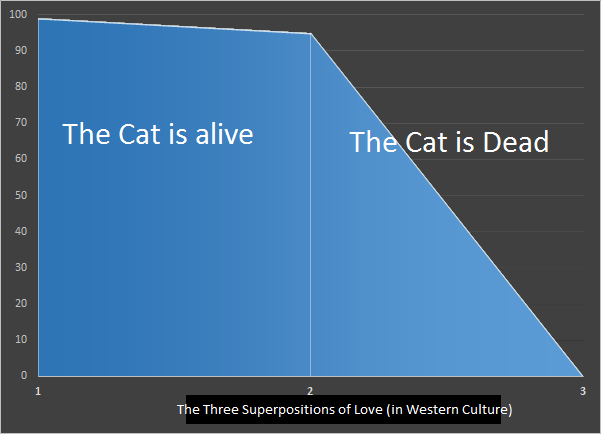 What the graph fails to show is that superposition 2 will close the gap towards 1 as the box is opened. If that sounds like a good thing, remember that superposition 1 is impossible. “People need sanity. Being in a constant state of existential crisis, debating the myth of progress and death isn’t going to help us put food on the table. If every expectation is a percentage lost and we lose them before we begin, why do we attempt, why do we pretend to love? A. Your couch – We acted responsibly even as the embers of previous loves drown, faltering in the depths of superposition 3. B. I decided to be honest with you after 3 years. C. It is dreadfully obvious to everyone how I adore you. D. I ended things with the other person. E. I realized you were never going to commit to me, other than occasionally, physically… So I gave you an out and swore I’d never tell. (We’d still be friends at the least, and could make the occasional eye contact that held more than your current relationship of four years does). F. You fucked us over with your inability to keep a secret. Naturally, the social bubble in which we exist was torn asunder. Needless to say, we were in trouble. G. I decided you were worth the trouble. H. You still wanted to hold me at arms length. Sentiments, visits in the night, and promises to escape. I. You talk endlessly about us. J. Your words slowly lose value as I realize words are never actions. K. I’m left alone, except sporadic shallow sentiments, again kept on a leash. L. You make plans… Plans for those plans and a few more for those plans. M. You tell me that you love me. But, you hide it from others. N. The holidays come and go. O. I spend them alone. P. You said I could kill you if you didn’t find me by the New Year. R. I’ve never been able to kill me. S. So I assume you’re going to have to kill yourself. T. If this is love. U. I understand the inherent destruction before it starts. Z. So we call it love anyway, when in reality it was merely an excuse for a tangent in a life of tangents. Who really ever finds their way into superposition 1 or 2? Why open the box if we can pretend we know there is nothing in it? Why open the box if we can lie to ourselves and pretend it may still live? The most detrimental part of this theory lies not in the plausibility of the graph, the pathetic declaration that ‘I am not that shallow’, nor those still dreaming, but in the fact that superposition 1 or 2 has to be met twice. Congratulations, you’ve found your “other”. Add three years to discover that they are still searching for theirs. If you refuse to accept the reality of superposition 3, there is only one option. Lie until you have to back out. Disaster is not a thing one can approach. It cannot tempt you, nor can you flirt with it. Disaster, like death, is with us from conception. From the moment of birth our each and every breath contains the possibility of unspeakable horrors. The development of an individual’s first memory proves that it is not until we discover the use of words that our imaginings begin to take shape. Speech gives us the untold power of creating the world around us. Alas, we are taught this power without understanding its true nature. While things like good and evil may exist, the power of “the word” is not inherently moral. Like any totem of mythical power, language cares nothing for how it is used or the effect it has on the one who wields it. Name a thing and you have power over it. Name a thing and you are actively exerting dominion over it. Name a thing, the ancient Egyptians believed, and you have called it into existence. And, like tyrants, this is what we do. We create stereotypes, by referring to the “black vote” as if it is an established fact. We create pain, by naming whether a relationship is going well, or poorly. We have created seventy million slaves in this country alone, by naming mental illness. I could enumerate countless disasters, each day created by the expunged breath of we seven billion humans that call this planet home, but what use in that? It is too late to prevent them. If we approach every problem as a unique incident, a failing, if you will, in the inherent beauty of nature, we have done nothing but build the foundation of our own demise. It is time to realize that we are not a part of nature. The natural world has order, beauty, and above all balance. I have been struggling since my first breath to find any semblance of balance in life. Beauty, peace, balance exist all around me, yet I rarely find them in myself. It is time to redefine disaster. The English word disaster comes from the Latin word disastro, meaning “ill-stared.” For generations we have treated disasters as if they are just that, ill fate. I posit that disaster comes not from some predetermined or accidental event, but from what we allow to be true. In this technological world it has become too easy to disdain the written and spoken word. People are content to communicate by pictures, meaningless symbols, and abbreviated phrases. No wonder my generation feels as if it has lost control of the world around it.